Good Evening! 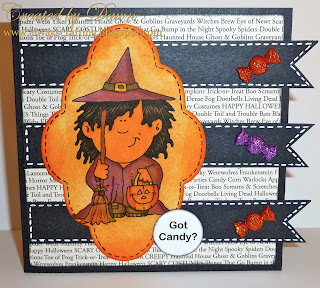 I made a card with the Hambo Stamp - Wee Henrietta Witch image. I wanted her to be a bit muted so I used an orange distress ink to accomplish that. The effect was perfect. I too love using distress inks, I don't end up with quite such inky fingers as with chalk ink! Great job Dawn. How cute! What a fab layout with the banners hanging off the edge. Thanks for joining in the fun at Whimsie Doodles, the orange fits right in with the inspiration photo! Completely cute! I like how the black strips come off the card. And I agree the orange is a great touch. Thanks for sharing with us at Designed2Delight. Dawn, adorable image and love those sparkly candy embellishments. Thanks for playing along with this month's Whimsie Doodles challenge. This is soo cute! Love the candy embellishments. Thanks for playing with us at Whimsie Doodles. I like your card...it is so cute! Thanks for playing with us at Whimsie Doodles.